With well-established regional markets such as North America and Europe presenting grim to moderate growth opportunities, emerging regions with an increased appetite for processed and packaged foods, confectionaries, and biopharmaceutical products can prove to be the most promising targets for companies in the global microbial fermentation technology market, observes Transparency Market Research in a recent report. Companies can benefit from the rising set of opportunities in emerging economies such as China, Brazil, and India that have billions of potential consumers seeking a diverse range of microbial fermented products to choose from. 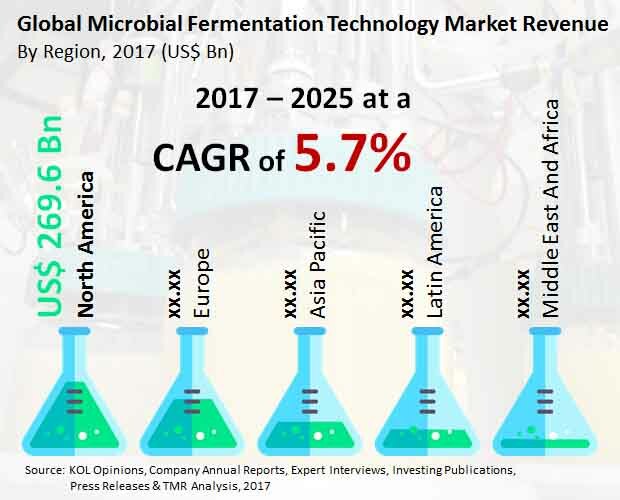 Therefore, focus on expanding businesses to cater to the rising demand for various food, feed, biosimilar products, and alcoholic beverages in these regions can prove to be an excellent growth strategy for players wanting to make it big in the global microbial fermentation technology market in the near future. Some of the leading companies in the market are Biocon, Lonza, Danone Ltd., Amyris, United Breweries Ltd., Novozymes, TerraVia Holdings, Inc., F. Hoffmann La-Roche Ltd., and BioVectra, DSM. According to the report, the global microbial fermentation technology market was valued at US$1,493.8 bn in 2016 and is projected to expand at a CAGR of 5.7% from 2017 to 2025 to rise to a valuation of US$2,447.5 bn in 2025. Geographically, the market in Asia Pacific dominated with nearly 40% share in the global market in 2016. Growth of the regional market can be attributed to the vast rise in geriatric population, a well-established chemical industry in China, cutting-edge research in the field of biotechnology and health care, and changing lifestyles in developing nations. The thriving nutraceuticals market in India is also likely to fuel the microbial fermentation technology market in Asia Pacific. In terms of product type, the segment of alcoholic beverages accounted for the dominant share in the overall market in 2016 and the trend is likely to remain strong over the forecast period as well, thanks to the expanding urban population and the rising popularity of alcohol among the young population of the globe. Fermentation technology has remained a highly favored biological process across a number of industrial applications for many decades due to low cost, high specificity, simplicity of reaction, and usage in versatile applications. While microbial fermentation has been used traditionally for preservation of foods only, it has seen a vast rise in application in the past few years owing to promising outcomes and the possibility of development of various bioprocess and products with its help. Modern industry has complemented the basic principle of fermentation technology with advances in genetic engineering by extending applications to produce a vast range products in the biotechnology sector, including biofuels, biochemicals, biopharmaceuticals, biosimilars, and biomolecules. Moreover, rising petrol prices and depleting reserves of fossil fuels have diversified applications of microbial fermentation process in the chemical sector to provide products such as alcohols, enzymes, organic acids, amino acids, vitamins, alkaloids, and Xanthan. The rising global demand for these products is likely to play a key role in helping the global microbial fermentation market expand at a promising pace in the next few years.